Need Holiday??.. Try West Bali National Park - Indonesia. History of West Bali National Park (TNBB) commencing on March 24, 1911, when a biologist from Germany, Dr. Baron Stressman, landed in neighboring Maluku Expedition Singaraja because the ship is damaged host II. Baron Stressman live in this region for three months. Through the research that is not intentional, Baron Stressman find the rare endemic bird species, namely Bali starling (Leucopsar rothschildi) Bubunan Village, about 50 km from Singaraja. Subsequent research conducted by Dr. Baron Viktor von Plesen, which concluded that the spread of Bali Starling Village Bubunan only covers up to Gilimanuk, ie + 320 km2 area. Therefore bali starling population when it is fairly rare, so in 1928 some 5 tail Bali starling was brought to England and successfully bred in 1931. Then in 1962, Sandiego Zoo in the United States is also rumored to have been breeding this bird. Apart from Bali starlings, other rare animals that live in this national park is a tiger bali. To protect these rare animals, the Kings Council in Bali issued Decree No. E/I/4/5/47 dated August 13, 1947 which establishes the region with an area of ​​Bishopscourt Forest 19365.6 ha as Protected Natural Park (Natuur Park) whose status is equal to wildlife reserves. After Indonesian independence, through the decree of Minister of Agriculture. 169/Kpts/Um/3/1978 March 10, 1978, the region consisting of the Wildlife Sanctuary of West Bali, Menjangan Island, Bird Island, Bat Island, and the island designated as a Nature Reserve Gadung West Bali with total area of ​​19558.8 ha. 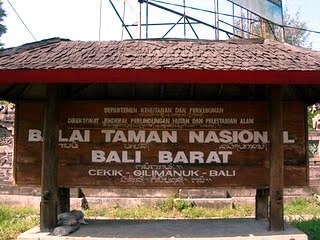 In 1984, West Bali Nature Reserve is designated as the West Bali National Park with an area of ​​19558.8 ha. However, since part of this national park area (3979.91 ha) is a Limited Production Forest (HPT), which becomes Forest Service authority, then through the Ministry of Forestry Decree No. 493/Kpts-II/1995 September 15, 1995, the spacious park only to be 19002.89 ha, consisting of 15587.89 ha of land area and 3415 ha of water area. West Bali National Park has a unique type of ecosystem, which is a mix between terrestrial ecosystems and marine ecosystems. In this area, tourists can explore the terrestrial ecosystems (forests), ranging from monsoon forest, lowland rain forest, savanna, to the coastal forest. While in aquatic ecosystems (marine), tourists can see the green of the mangrove forest, coastal beauty, ecosystem coral, seagrass, and shallow and deep ocean waters. Entering the forest, the tourists can find about 175 species of plants, 14 species of them relatively rare, among others bayur (pterospermum diversifolium), ketangi (Lagerstroemia speciosa), burahol (steleochocarpus burahol), sandalwood (Santalum album), sonokeling (Dalbergia latifolia ), and others. In addition, tourists can also see various types of direct free-living animals in parks, such as the Bali starling (Leucopsar rothschildi) which is endemic and rare animal, bird black head white ibis (threskiornis melanocephalus), deer (Muntiacus muntjak) pangolin (sweet javanicus), hedgehogs (hystric brachyura), and deer (tragulus javanicus). While well-known fauna species in the waters of this national park is a shark (Carcharodon carcharias), fish flag (plateak pinnate), and giant clams (Tridacna gigas). Other underwater riches are different types of coral reefs vary widely. Data collection conducted in 1998 showed, there are 110 coral species in 18 families, including 22 species of which species of coral fungi (mushroom coral). Besides enjoying the terrestrial and aquatic, visitors can also explore the small islands that are part of the West Bali National Park, among others, Menjangan Island, Gadung Island, Bird Island, and Bat Island. Menjangan Island is one of the favorite islands are often visited by tourists. The island with an area of ​​about 6,000 ha of this is the habitat of deer or elk (cervus timorensi). Not only that, visitors can also dive in the waters around the island to see a lush cluster of coral reef fish species are diverse. Besides enjoying the natural beauty and wildlife, visitors can also make a pilgrimage tour to the tomb Mbah Temon, the ruins were found by community elders named Mat Yamin in 1954. Named Mbah Temon because this ruins recently discovered (meeting or meet) after Mat Yamin do if meditation. Others are quite legendary ruins is the tomb of I Wayan Jayaprana. Jayaprana is a handsome young man who is told in the Babad Bali had been killed by Patih Sawunggaling, emissary of King Kalianget, because the king wanted Jayaprana beautiful wife, Ni Nyoman Layonsari. TNBB territory lies in two districts, namely Sub Melaya, Jembrana regency, and Gerokgak District, Buleleng District, Bali Province, Indonesia. West Bali National Park both within easy reach of the city of Denpasar and from the Port of Gilimanuk. This is because the location of this national park is traversed by the highway Gilimanuk-State and Gilimanuk-Singaraja road. To get to the location, tourists can use private cars or using public transportation (bus, taxi, or charter a car). To facilitate travel, the tourists can reach the West Bali National Park with two alternatives. First, when starting the journey from Port Gilimanuk, then the tourists can visit the Office of the West Bali National Park is located in the village of Gilimanuk, District Melaya, Jembrana regency. This office is about 200 km from Denpasar City. The second alternative, when the tourists set out from the direction of Denpasar, or specifically wanted to visit the island, so it's good to start from the Gulf of Labuhan Lalang. From Labuhan / Pier Lalang tourists can easily toward the island or other small islands. Ticket prices to enjoy the West Bali National Park is USD 2500.00 per person for domestic tourists, and Rp 20.000,00 for foreign tourists. West Bali National Park has a wide range of accommodation and facilities, including tourist guides (guide), guard hut, hut tour (to break tourists), the tower of view, a path for easy surfing, scuba gear rental, boat speed, etc. . Travelers who want to dive with dive operators renting cost you about U.S. $ 55 (June 2008). The price includes lunch, boat rental, diving equipment, and transportation costs. Especially for the facilities for crossing to the island, tourists can rent a boat with outboard engine. Rental fee of Rp 250,000 per four hours. 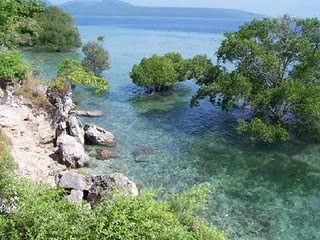 If you want to add time browsing, for example by exploring the waters around the island, then an additional charge of Rp 20,000 per hour (June 2008). If tourists require accommodation, around Labuhan Lalang and in Port Gilimanuk there are many good inns hotels, resorts, and hotels.